Welcome to SitcomsOnline Digest! It's looking like a very snowy holiday weekend for a big chunk of the northeastern US, so it's a great time to sit at home and enjoy lots of sitcoms, including some new streaming options! Let's get going! 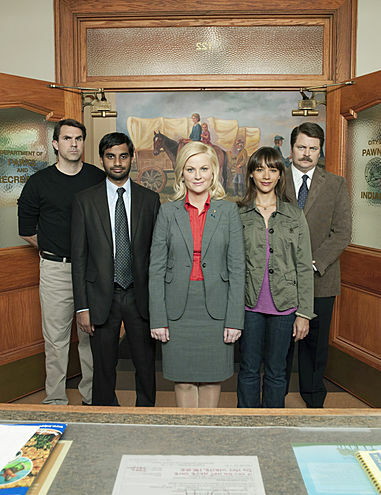 Parks and Recreation debuts on Comedy Central on Monday, with a marathon to kick things off. This weekend, Decades has a binge of 21 Jump Street. Pluto TV, a free "streaming cable service" (probably the best way to describe it), has launched Pluto TV Sitcoms this week, where you can watch sitcoms all day long. As previously mentioned, Sinclair has also launched STIRR, which brings BUZZR (also available on Pluto TV), Charge, and Comet to viewers anywhere in the United States. Conan returns to TBS, with a new format, on Tuesday. The last batch of episodes of Unbreakable Kimmy Schmidt will be released on Friday on Netflix.